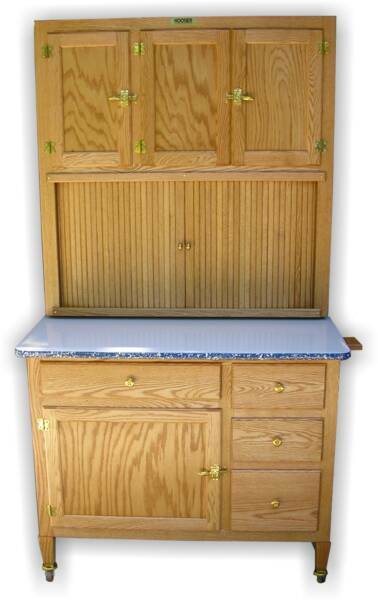 Watch as we build a Hoosier Beauty cabinet for Sandee from Green River Wyoming. Sandee ordered many of the optional features including the tin flour and sugar bins, extract shelf, cooking charts and cook book holder, food grinder bracket and slide-out shelf. Watch as we build a custom Hoosier cabinet for Yona from Westmount Quebec. (Same as above link until the custom options phase) Optional features include: Pan rack, slide-out shelf. Custom features include: Large horizontal tambour door (instead of two smaller vertical tambour doors. Large lower right drawer built to house cooking sheets. 2. First Cuts in the Shop. Here's a custom cabinet we're building for Stephanie from Center Port New York. You can follow it's process from design concept and working drawings to the final finish. 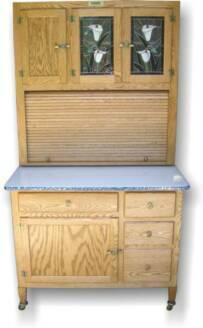 We're building a beautiful cabinet with three leaded glass doors for Lynn in Dayton Ohio. This cabinet is loaded with options and has some nice custom extras as well. This Hoosier Table is being built for Terry and Carol in Norwalk California. Jim in Alameda California designed several custom features for his cabinet and even sent us his drawing to work from. Thanks Jim.